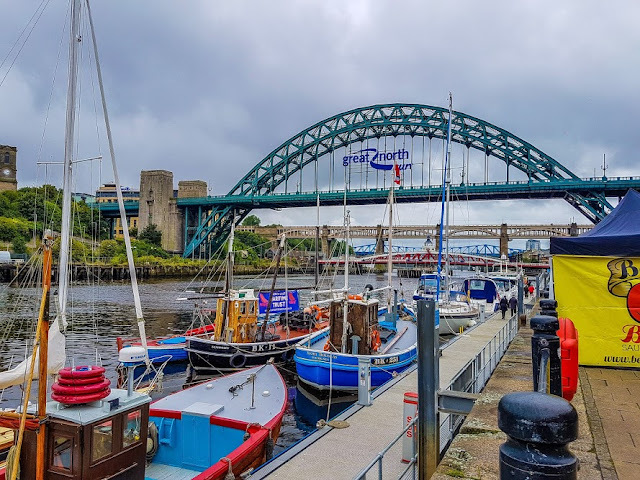 During a recent long weekend in Newcastle, I discover the wonders of the Quayside, down by the peaceful banks of the River Tyne. These are my recommendations on how to spend a relaxing day on the north and south shores of the river. 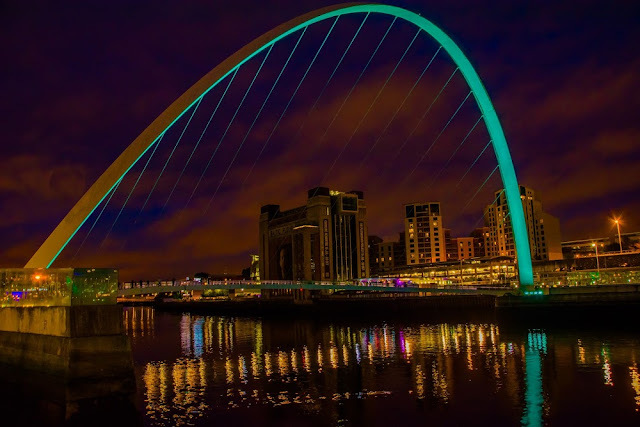 The Quayside is the area around the north banks of the River Tyne in Newcastle, and the south bank in Gateshead. The Quayside was previously a busy port area that has been heavily (and very well) regenerated. 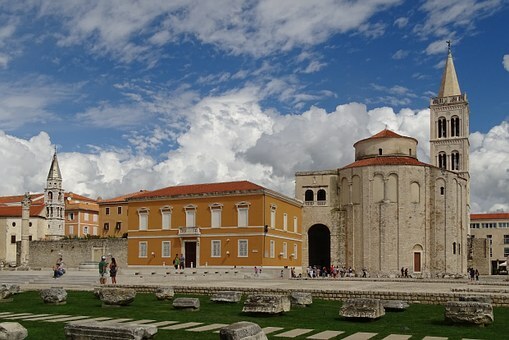 It's now one of the city's most visited areas, and it's not difficult to see why. The iconic bridge, completed in 1932, links the city of Newcastle with its neighbour across in Gateshead. It is one of several bridges that span the river, but it is, without a doubt, the more famous and recognisable of them all. 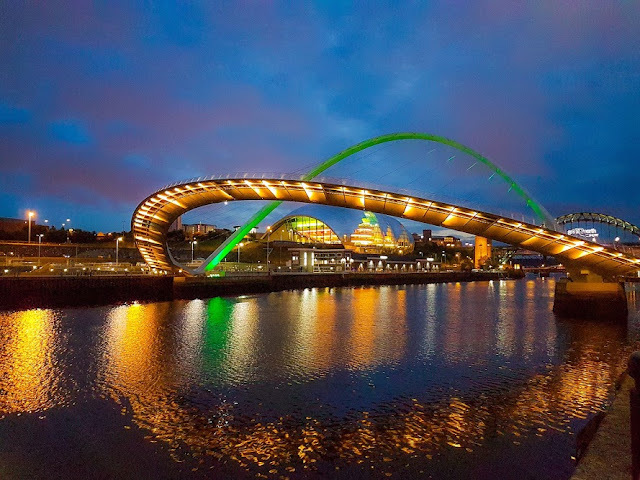 The bridge design is loosely based on an altered version of the Syndey Harbour Bridge in Australia, and gives a nod to Newcastle's industrial heritage. You can obviously cross the bridge using cars, vans, motorbikes and, I daresay, even tuk tuks, if you really wanted, but in order to really take some time to appreciate it, you have to walk. 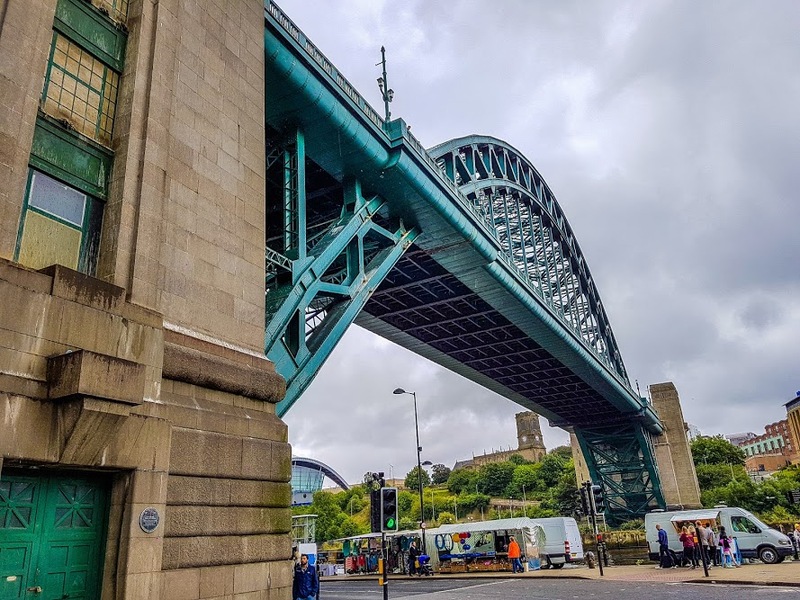 There are flights of steps close to the Quayside that you can happily clamber up in order to take a wander across the bridge and see the wonderful views up and down the river. This beautiful former flour mill, sitting on the south side of the Tyne in Gateshead, was first owned and run by Hovis from 1950 to 1981. After closing in 1981, it lay unused until a competition was launched by the RIBA for architects to submit suitable designs to transform the building into an arts venue. A massive refurb was undertake and the all new Baltic for Contemporary Art was officially opened in the Summer of 2002. The Centre hosts an ever changing programme of events throughout the year, and these have included prestigious events, such as the 2011 Turner Prize. This was the first time the TP had been held outside the Tate London or Tate Liverpool in its history. 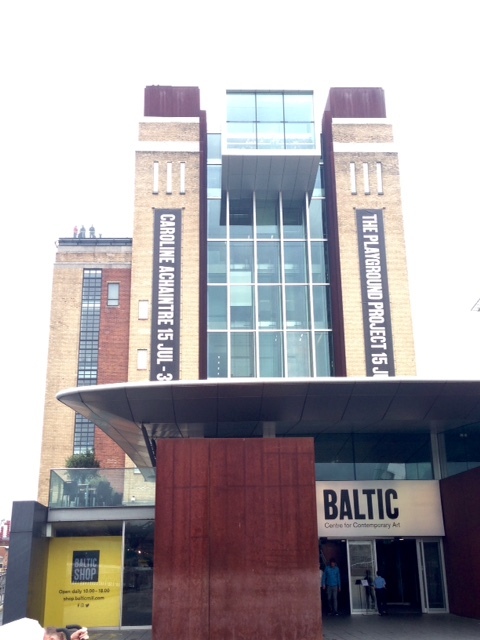 The move was a resounding success when Baltic welcomed more visitors than any previous Turner Prize exhibition. 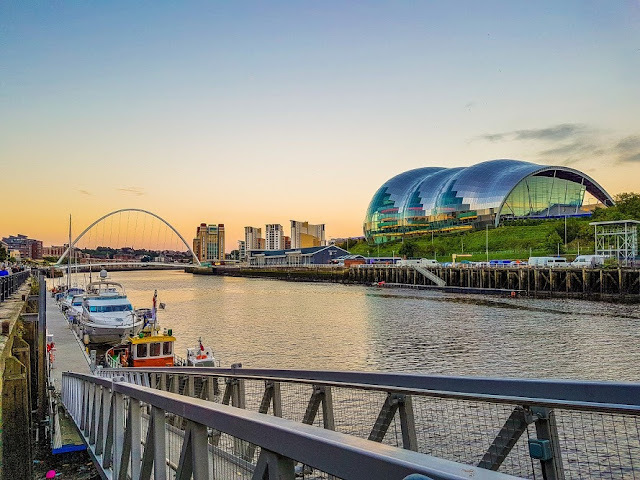 As well as gallery space, Baltic also has a contemporary bar and cafe on the ground floor; a lovely store, a SIX, which is the name of the restaurant located on the top floor of the building and offers fantastic views out across the Millennium and Tyne Bridges, as well as the city itself. It's definitely not a bad spot to indulge in some brown ale. Me, stalking the Baltic from the bushes across the river like a maniac. This fabulously shapely concert venue, like the Baltic, was developed after a design competition. This battle was won by Foster and Partners and the multi performance area venue, complete with bars, brasserie and a music library (amongst other things) was opened in 2004 at a cost of £70m. A total bargain, if you ask me. But no one did. 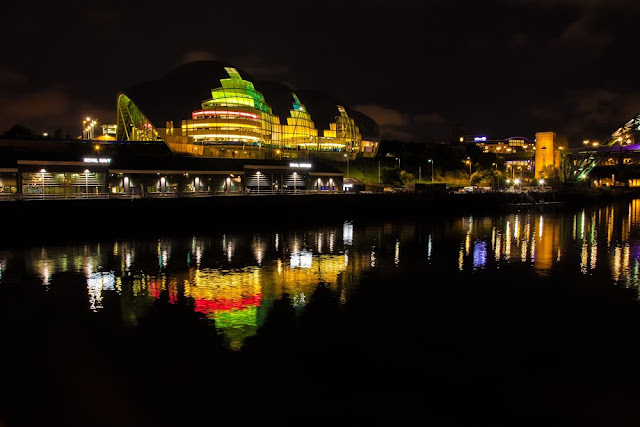 Although The Sage looks fantastic and shiny when hit by the sun during daylight hours, it is best to viewed at night when you can properly see just how innovative the design is. I know nothing about architecture, so it'd difficult for me to describe quite how the inside of the building looks like it's on the outside when the lights come on, so I won't bother and just leave you with this photo. It explains much better than my poor attempts ever could. So, while we're on the subject of amazing multicoloured new Wonders of the World, we should take a second to talk about the Millennium Bridge. It just *might* be even more colourful and curvy than The Sage. The Gateshead Millennium Bridge, to give it its Sunday name, was built to celebrate the turn of the century and was partially funded by the Millennium Commission. The £22 million investment has resulted in the world's first tilting bridge and carries pedestrians and cyclists from Newcastle to Gateshead...and often back again. The tilting of the bridge happens to allow the safe passage of boats down the Tyne and the complete process of tilting and...untilting(??) takes around four and a half minutes. During this time, the bridge glows in a rainbow of colours and is mesmerising to watch. And I don't say that very often. Not about bridges, anyway. It is really spectacular and made me smile like a lunatic for a good while after the bridge had resumed its normal business and was all like 'move along now...nothing to see here'. If you are taking in the sights of the Quayside at night, do be aware that there a lot of bars around the area. Weekends are therefore likely to be quite noisy, as it was during my Sunday night visit on a Bank Holiday weekend. There was a fair bit of singing and dancing going on - as there is in every city centre on a weekend - so do pop over during the week if you'd rather avoid the crowds. Possibly the cutest beach ever. And no sewage! Did you know Newcastle had a beach? No? Neither did I! 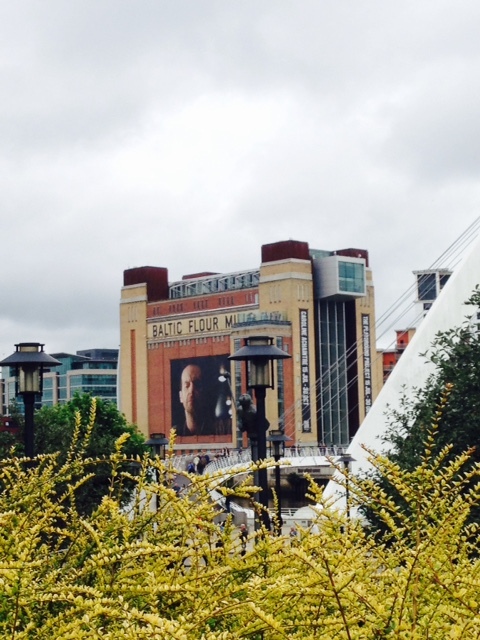 However, I can assure you that it very much does, and it's right on the North bank of the Tyne. Now, I didn't say it was a proper beach, but it is a beach nonetheless. Vueling's popular summer attraction is back in 2016 and is a little area on the banks, replete with striped deck chairs, gorgeous pastel coloured beach huts and, well...sand, obviously. 2016 is the fifth year that the installation has been built in the city and this year it has the added bonus of having Riley's Fish Shack right on its doorstop. 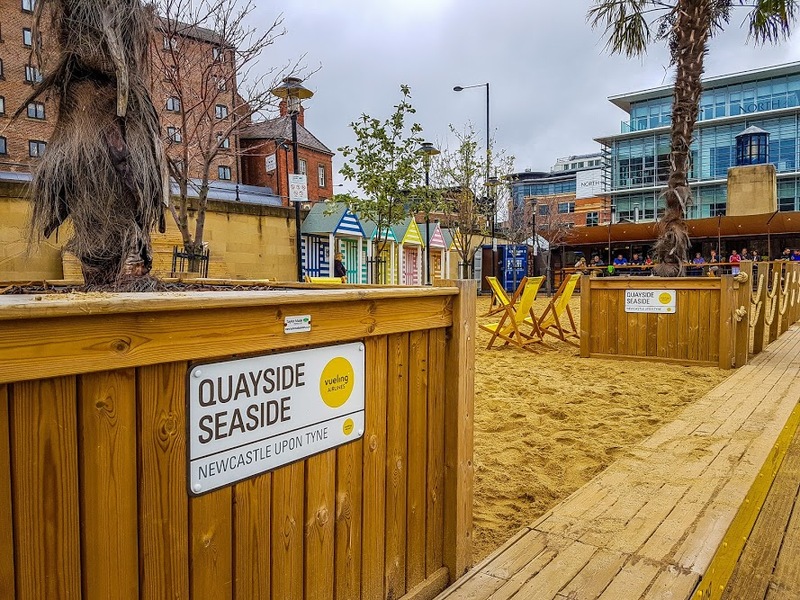 Now you can lounge in the sun on your deckchair and only have to walk a few yards for excellent fish and chips. A great place for food and drinks. Sorry about the shot of the back of my head. Firstly: this is NOT a boat. 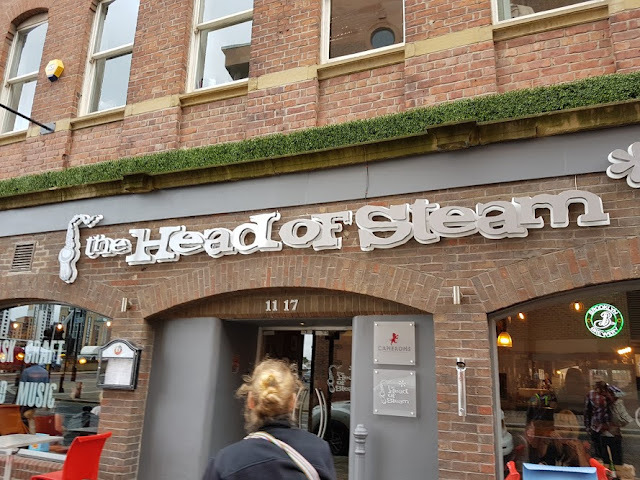 It is, rather, a gorgeously decorated bar just across the road from the Quayside and within quick darting distance for when your feet have had too much. The Head of Steam is often listed as one of the best bars in the city and is conveniently situated across from the main train station, as well as the Quayside. After a few hours of wandering around, we popped in for coffee. And by coffee I mean a glass of red wine that was larger than my head (I love you, Newcastle), and found ourselves a wonderfully atmospheric bar with lots of tables; intimate little booths, and Central Perk like comfy seats next to the window where a weary Scot can rest her tired feet while still being able to enjoy the views out across the river. Not only is the bar FULL of drinking options (and that can never be a bad thing in my book), but it's also famous for its musical links. How can a bar that provided a stage to Maximo Park or The Arctic Monkeys ever be bad? Exactly. The bar hosts regular music events, has a seriously tempting menu and a range of gins that would keep my mother happy for months. This, as the name suggests, only applies to your visit if it falls on a Sunday. And you should definitely try to make sure it does, because the market is wonderful. Taking up a good length of the Quayside, the market dates back to the Middle Ages, and is full of artisan stalls selling cupcakes, hog roasts, speciality coffees; fruit and veg (including the biggest onions I have EVER seen), jewellery, candles, and a whole host of other gorgeous products. It's a great place to spend some time moseying around, with a steaming coffee in hand, before you head further up the river towards the Millennium Bridge.